OBX Brewfest note to self: alcohol and coherent writing do not mix. Which is unfortunate. Someone mentioned that there were 54 brewers lined up in the tents and all of them had at least two, and some of them three samples to try. That’s a lot of beer and a lot of beer to not have the opportunity to sample. So the experience in this case is vicarious, an indirect reflection based on the experiences of others. There were some very different beers being offered. Andy Christenbury from G2B in Durham come up with two of the most unique or interesting brews—his cucumber salt saison and a toasted coconut IPA. The reaction to this particular combination was interesting. Most of the people I spoke to agreed with Katie, but there were a few that felt it was too salty, so it becomes a classic example of individual taste. 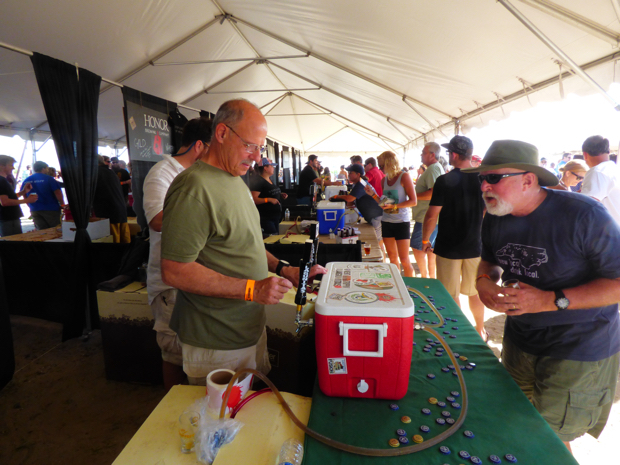 Something that really stood out were how many North Carolina brewers were pouring. It would be difficult on short notice to get an accurate count but the home state was well represented. What made the day so great, though, was that although beer brought everyone together, there was much more to do than sit around and sample beer all day long. The Mark Schimick Band is bluegrass with some very interesting twists thrown in. Tight musically, great musicians—truly worth seeing. Tauk seems to paint heavy metal dreamscapes. Interesting and different, there sound is compelling. Then there was The People’s Blues of Richmond. I thought they were great at the Mustang Music Festival last October; they were even better at Brewfest. A hard, driving rock sound, tight arrangements and an innovative approach to music make them a group to watch. There were also a lot of booths set up . . . artists, artisans, different items not seen anywhere else. One of the more interesting booths I stopped by was Crude Bitters from Raleigh. Bitters in this case refers to flavoring, the essence of a certain flavor that is used to enhance or tweak the taste of a mixed drink, beer or soda. There’s pineapple ginger, watermelon basil and too many more to list them all. Novel and different—certainly worth knowing about. This was the inaugural event at the Outer Banks Event Site. Soundside Spectacular at the beginning of May was supposed to be the first, but weather delays in construction forced organizers to move the show to the Nags Head beach. Actually the Event Site was barely ready for Brewfest—some of the concrete for the walkways wasn’t quite set and sod hadn’t been planted yet, but it was certainly ready enough for the event. The event was organized by Hype Promotions and hopefully this will be the first of many annual Brewfests. It was a very well run, very enjoyable day. I should mention that some of the proceeds benefit the Dare County Arts Council. I should also mention that the toasted coconut IPA was very good. Smooth, with a little bit of the traditional hop bitterness of an IPA, it was refreshing and well-balanced, with a hint of toasted coconut on the finish. Very nice. And yes, I did fall off the wagon on that one.